Your profile picture and headline are two of the most important and most viewed elements of your profile. Having a profile picture makes your profile more likely to be viewed by recruiters and future employers. Instead of ‘Graduate from Lehman College, experienced in Banking and Customer service, currently seeking employment within Healthcare’, use your headline to give a quick summary of your background and the type of position you are seeking. One example of this could include ‘Recent College Graduate with Banking and Customer Service Experience Seeking Healthcare Position’ or “Health Services Administration Graduate Seeking Position’. 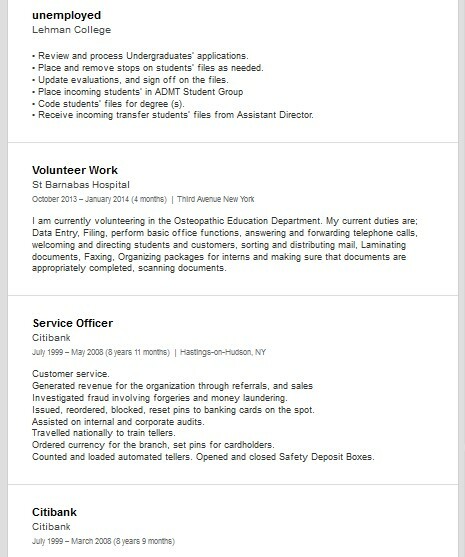 In your experience section, you have the title ‘unemployed’ listed with Lehman College and a list of duties. This information may be confusing to your profile visitors. This information should be updated if it was a position that you held while you were in college. Review your profile for spelling errors. The word ‘healthcare’ is misspelled in your headline and ‘administration’ is misspelled in your education section. You might be also interested in our forklift operator Linkedin profile review. The LinkedIn profile either of an employed or unemployed professional must be created by following all the updates. The health services administration is an important field for many corporations. Try to share all the major related skills in your profile. Treat your LinkedIn profile like you write the resume. 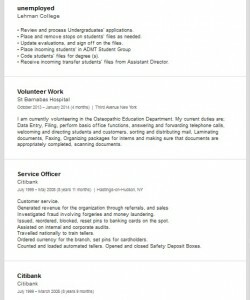 Add the education history and work experience in detail. If you’re an unemployed individual, pay more of your attention to the prior experience of work and keep this section on the top. If you’re an employed individual, your major focus must be on the skills and other activities i.e. sharing website, personal blogs etc. Avoid the grammatical errors in articles. The spelling mistakes are also not permitted for creating best profile. Try to add at least 50+ connections to make the profile stronger. The profile photo is highly important to upload because employers also want to see the real you. This also has a higher impact on securing a good job. The minimum number of skills you need to add must be three in number. The health services administrator have a quite responsible job to manage the procedures of delivering best services with no delays. Therefore, it seems not easier to get an ideal job in this field. In this era of tough competition, it is important to include education history, two past positions, up-to-date recent position and location along with the industry. Arrange a session of discussion with any professional or an individual who’ve plenty of connections in the respective field. This would be quite helpful for you. 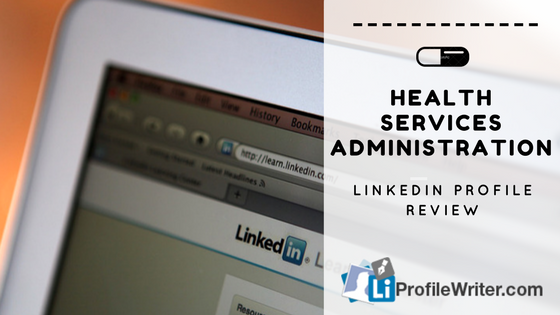 Avail our professional help today to make your health services administration LinkedIn profile stand out from the rest! The career of health administration seems to be brighter for long-term. Every seven out of ten health administrators actually don’t create the LinkedIn profiles that live up to expectations. This is the reason that becomes major obstacle to provide you perfect job. The 80 to 90 percent employed individuals in health administration program in first world countries get higher work opportunities. In the third world countries, many individuals find it hard to get a job in a respective field only because of creating a quintessential LinkedIn personal profile. Writing LinkedIn Profile Review: Learn How to Do It? The LinkedIn profile’s review is based on updating and refreshing your page of this social networking platform of professionals. If you haven’t assessed your connections, you are doing a big blunder. This is one of the important steps to focus on making the profile more attractive. Simply, try to get back to the people who’re beneficial for building your business, block people who’re creepy and delete individuals who’re not relevant. Let’s start viewing personal activities on your profile. To increase views and visibility of your LinkedIn profile, sharing updates become one of the perfect ways. Never avoid viewing the prior updates and pay attention to this activity seriously.